The first full week of earnings gets underway today with the investors perhaps still wiping their collective brow from all the ups and (mostly) downs of the last few sessions. Stocks fell 4 percent last week in the worst plunge since February, and major indices start the week back near July levels. It may be a new week, but the market apparently hasn’t shed all the negative sentiment that characterized last week’s action. Weakness in Asia and Europe overnight appeared to help set the tone on Wall Street, where stocks fell in pre-market trading. Retail sales data for September out this morning didn’t appear particularly helpful, rising just 0.1 percent when Wall Street analysts had been expecting 0.6 percent, on average. It was the second straight month of tepid retail sales growth and might cause some concern about the state of consumer demand. In earnings, banks remain in the spotlight, with Bank of America Corp. (NYSE: BAC) reporting today and Goldman Sachs Group Inc. (NYSE: GS) and Morgan Stanley (NYSE: MS) tomorrow (see more below). Bank of America earnings of 66 cents a share beat the third-party consensus estimate of 62 cents, while revenue of $22.777 billion pulled in just above the $22.67 billion consensus view. The headline numbers looked relatively strong, but the bank’s investment banking unit saw fees fall 18 percent on the year, and trading revenue fell 2.5 percent. However, deposits grew 5 percent, and BAC’s earnings appeared to benefit from lower taxes. Aside from BAC, today is relatively light on major earnings news. Expected earnings releases Tuesday include the first major results from the new Communication Services sector as Netflix, Inc. (NASDAQ: NFLX) steps to the plate. Also expected are a visit from “Big Blue,” otherwise known as IBM (NYSE: IBM), and a walk down the medicine aisle with earnings from Johnson & Johnson (NYSE: JNJ) and UnitedHealth Group Inc. (NYSE: UNH). There’s also some data on tap in the days ahead, including September retail sales out this morning and housing numbers later this week. The housing sector could remain one to watch for more clues about the economy, with 30-year mortgage rates closing in on 5 percent and hitting their highest level since 2011 last week. Last week wasn’t a good one for the home building sector, with shares falling to new 52-week lows for several major firms. If you have the stomach for it, let’s look back at sector action last week and see how it played out. If you’re hunting for a sector that went against the trend, you won’t find one. Every SPX sector fell. It’s only a question of degree. The best performer was utilities, which dropped just 1.26 percent, followed by consumer staples with a 1.94 percent retreat. That could indicate some investors searching for so-called “defensive” parts of the market where they hope to see less volatility, though there’s no guarantee. Materials fell the most, plummeting 6.59 percent last week. Industrials closely trailed with a 6.51 percent loss, and financials fell 5.57 percent. The plunge in materials and industrials might partly reflect concerns about declining U.S./China trade relations and associated tariffs and how that might play into forward guidance from major industrial and materials firms as earnings season continues. The financial sector slumped despite decent Q3 numbers from the first three big banks to report and the recent climb in Treasury note yields. Some investors seem to be keeping away from financials, perhaps because they were burned when rates rose and then fell earlier this year. Anyone looking to Europe or Asia for relief wouldn’t find it. Japan’s Nikkei fell 4.58 percent last week, and the Stoxx Europe 600 dropped 4.64 percent. The Shanghai Composite did even worse, plunging 7.6 percent, but that partially reflected much heavier trading than usual since it had been closed the entire week before in observance of a holiday. In corporate news, Sears Holdings Corp. (NASDAQ: SHLD) filed for bankruptcy after 132 years in business, another apparent victim of online shopping. The company said in a statement that it intends to stay in business, keeping profitable stores open. Many have closed already, though. It’s been a long time since those days of combing through the Sears catalogue at holiday time, as some people might remember. 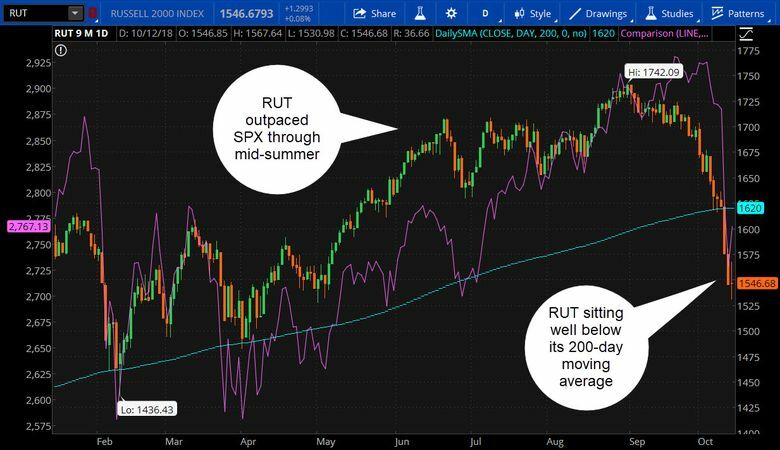 After outperforming the S&P 500 through mid-summer, the small-cap benchmark Russell 2000 Index (RUT) headed south. Before last week's hard selloff, RUT had already dipped a toe in the sub-200-day moving average water (see figure 1 above). And RUT barely nudged higher in Friday's recovery. Why has the small-cap index gone from leader to laggard in such a short time, especially given all this talk of trade wars, which should, theoretically anyway, benefit smaller, domestic firms versus large multinationals? One issue is leverage. According to FactSet, debt-to-earnings levels among RUT components are about 3.5 percent — about double that of companies in the S&P 500. So a rising interest rate environment could pose more of a challenge for RUT than for SPX. And though there are still trade tensions, particularly between the U.S. and China, the USMCA—the name for the NAFTA replacement deal agreed to a couple weeks ago—seemed to cut into RUT's lead. It's not all bad news for small-caps, though. Had your eye on specific small-cap names but couldn't justify the price a couple months ago? A pullback of this magnitude may offer up some opportunities for those who've done their homework. After Bank of America (BAC) today and three other big banks that shared results last Friday, tomorrow’s reports from Morgan Stanley (MS) and Goldman Sachs (GS) arguably wrap up the financial earnings season, though lots of smaller banks and credit card firms still report in the days and weeks ahead. Like a freight train roaring by, the big bank earnings season is fast, noisy, and doesn’t stay around too long. GS and MS are both investment banks, and the focus with GS might turn to fixed income, currency and commodity (FICC) trading revenue, as well as investment banking. Some of those same areas are also key for MS, along with wealth management. Though there’s been a lot of volatility lately, the Q3 wasn’t a hugely exciting environment, so the question is whether that affected the companies’ trading revenue. Last week, JP Morgan Chase & Co. (NYSE: JPM) reported what it called “mixed results” in its fixed income business. Kind of lost in the shuffle amid all the market turmoil last week were two relatively benign inflation numbers. 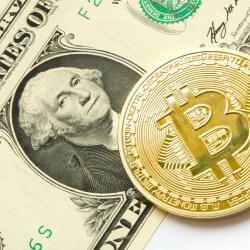 The consumer price index (CPI) rose less than Wall Street analysts had expected in September, at just 0.1 percent, and the Producer Price Index (PPI) rose 0.2 percent, in line with expectations. Core CPI, which strips out food and energy costs, rose 2.2 percent year-over-year, which was down from August. While these numbers stand a touch above the Fed’s stated long-term goal of 2 percent and probably point toward continued likelihood of another rate hike by the end of the year, they don’t seem to indicate an “overheating” economy that would force the Fed to move even more quickly. The futures market projects December rate hike odds at 78 percent, down from above 80 percent a week ago but still a solid indication that many investors see another likely 25-basis point increase before year-end. Odds of another hike in March remain above 50 percent, futures prices indicate.